This Solway Tours blog highlights 7 incredible local World War 1 stories. At Solway Tours we are passionate about bringing as many people to the local area as we can however we also believe in sharing the story of our region and its people on a global platform. Our local area played a huge role in our victory during the Great War however we would like to share with you seven of the people and events that everyone from this region should know about and never forget. Like so many families right across the country one local family from Kingholm suffered devastating losses during the First World War. Mrs McFarlane who resided at Kingholm in Dumfries lost three of her sons during conflicts on the Western Front and her other son was taken as a Prisoner of War. This story unfortunately is not unique as many families from Dumfries and Galloway lost multiple family members during the Great War. The sacrifices made by the McFarlane family and all the residents of Kingholm who lost their lives during the First World War will never be forgotten because their names are now commemorated on a memorial plaque that local residents have ensured is clearly visible to all visitors. When the new housing estate in Kingholm Quay was built there has also been a street named McFarlane Avenue in commemoration of the family’s huge losses. Of the eight men named on the memorial plaque opposite the Swan in Kingholm Quay who died during the Great War there are four by the name of McFarlane. Pte John McFarlane father to the four boys would have been too old to be serving at the front but he served in the Royal Defence Corps and he died at the age of 51 on 29th May 1917 and he is buried in Dumfries St Andrew’s Cemetery. His three sons had sadly predeceased him and all lost their life during the Great War. Private James MacFarlane of the Kings Own Scottish Borderers was killed on 6th May 1915 and is remembered on the Menin Gate Memorial in Ypres. Private Martin McFarlane died on 30th September aged 30 at Loos where the Scottish suffered heavy losses and he is remembered at Wimeraux Communal Cemetery. Private John McFarlane also of the Kings Own Scottish Borderers died on the 3rd July 1916 aged 31 and he is remembered at Vermelles British Cemetery in France. The four McFarlane’s are also mentioned on the Dumfries War Memorial at Newall Terrace. Private James Mackenzie was subsequently awarded the Victoria Cross for conspicuous gallantry. His Victoria Cross is now held by the Scots Guard Regimental Headquarters. Private James Mackenzie is commemorated on the Maxwelltown War Memorial, by a stone plaque in Troqueer Parish Church and on December 19th 2014 a commemorative paving stone was unveiled at the Maxwelltown War Memorial in Dumfries where family members were present. Private James Mackenzie is also commemorated on the Ploegsteert memorial, near Ypres, in Flanders, Belgium. At 6.49 am on Saturday 22 May 1915 a Liverpool-bound troop-train carrying the 7th Battalion, The Royal Scots collided head on with a local passenger train, which had been ‘parked’ on the main line at Quintinshill, just North of Gretna, to allow a following express to overtake it. The troop train overturned and a minute later the Glasgow-bound express ploughed into the wreckage causing it to burst into flame. The crash which killed 226 in total remains the worst rail crash in the United Kingdom. It was a devastating blow to the Battalion and to the whole population of Leith – it was said that there was not a family in the town untouched by the tragedy. Both signalmen involved were subsequently charged, appeared before the High Court in Edinburgh on 24 September and found guilty of culpable homicide. After the crash it was decided to raise a memorial, paid for by public subscription, alongside the communal grave in Rosebank Cemetery in Edinburgh. A number of bodies were never recovered, having been wholly consumed by the fire, and the bodies that were recovered were buried together in a mass grave in Edinburgh’s Rosebank Cemetery. Four bodies, believed to be of children, were never identified or claimed and are buried in the Western Necropolis, Glasgow. On Friday 22 May 2015 there will be a major commemoration at the Memorial Cairn at the Old Blacksmith’s Shop at Gretna and beside the railway line on the site of the old Quintinshill signal box. HRH Princess Anne, The Princess Royal, will attend the Centenary Commemorations at Quintinshill on 22 May. Have you ever driven past the sign on the A74 and wondered what “Devils Porridge” is? The quiet rural area that surrounds Gretna and Eastriggs was once the home of what is said to be the greatest factory on earth! HM Factory, Gretna, was a munitions factory during the First World War and was created in response to the munitions crisis. As early as 1915 it became clear that the British and Allied troops were suffering huge losses and that there was a shortage of ammunition already. Chosen for it remoteness and easy access to services and supplies the site was chosen to host a factory that was 9 miles long, 2 miles wide, and stretched from Eastriggs in the west, past Gretna and across the Scottish/English border to Longtown in the east. At its height HM Factory Gretna employed 30,000 workers, the majority of them being women. By 1917 the factory was producing 1,100 tons of cordite per week, more than all the other munitions factories in Britain combined. This provided much-needed ammunition for the troops fighting on the front line. The communities of Gretna and Eastriggs were established in order to house the workers of the munitions factory and the influx of so many workers was felt by the whole community. Gretna as a community is steeped in history. Not only was HM Factory Gretna established but the local community had to adapt to the sudden influx of workers and one example of how the community grew was in the Hotel now known as The Gables Hotel. It started as a doctors Home and Surgery after the Ministry of Munitions of War called for doctor’s surgery to be established in 1915. The unique name for the museum was said to be inspired by Sir Arthur Conan Doyle. While visiting the factory as a war correspondent he was said to have witnessed the munitions girls mixing the nitro cotton by hand, and commented ‘that is the Devil’s Porridge’. Due to a group of dedicated volunteers it has grown from being a small exhibition in St John Church in Eastriggs, to now being a fantastic museum that tells the story of HM Factory Gretna very well. The Devils Porridge museum is now a new state of the art interactive museum and is well worth a visit. From experiencing what it was like to be a soldier living in the trenches to what life was like as a munitions girl at the factory, this museum really has something for everyone. McGuffie was rightly awarded the Victoria Cross for this incredible heroism. In the trenches where Louis fought at Bayernwald (Bavarian Wood) was a number of German battalions from Munich and the surrounding area. Adolf Hitler had been a runner in the same trench system only a few months before Louis arrived and had “gone over the top” attacking British trenches that Louis was to spend that last few days of his life in. Louis was killed in action at Wytschaete, Belgium on 4 October 1918 only 38 days before the Armistice was signed and the war ended. During WW1 many casualty clearing stations (CCS) were set up. There were usually the initial surgery areas for many troops who had been injured at the front. Dumfriesshire was amazingly at the forefront of supplying wound dressings for their field hospitals by using moss from the hills in the region. Sphagnum Moss was gathered, dried and dispatched in huge numbers especially by groups in the East of the region at Langholm, Beattock, Lockerbie and Lochmaben. It was then turned into field dressings to be sent and used at the CCS at the front. Local women raised funds to organise the Sphagnum Moss Works and Voluntary Aid Detachments (VADS) worked tirelessly to gather and process it. Work continued into 1919, even after the Armistice, to treat soldiers using the local moss. It is stated that Eskdale alone had contributed over 70,000 dressings and the area was praised for its incredible efforts in ensuring medical supplies were continuously refreshed and sent to the battlefields. Lots of local school groups from Dumfries and Galloway make a special visit to the grave of Nellie Spindler at Lijssenthoek Military Cemetery near Poperinghe to commemorate the incredible role of all women during the Great War. Nellie is one of only two women to be buried out in the Western Front alongside the men she cared for. It has been estimated that over a quarter of all Scots who fought in the First World War were killed. There is hardly a town or village in Scotland that does not have a memorial to those who died and Dumfries and Galloway is no exception. The work of raising memorials began almost as soon as the war ended and war memorials can now been seen across this region usually placed in prominent places such as near churches. It is vital that we remember the sacrifices made by so many during the First World War. They gave their today for our tomorrow and the sacrifices made during the war were felt by the whole country and Dumfries and Galloway was no exception. There is one remembrance service that takes place on a daily basis and that is the Last Post ceremony at the Menin Gate, Ypres in Belgium. At 8 o clock every night visitors from all over attend the ceremony which is the final salute to the fallen soldiers of the British Empire and its Allies. The Menin Gate bears the names of 54,000 officers and men whose graves are not known and at this daily service the buglers play in honour of the memory of the soldiers who fell in the Ypres Salient during the First World War. 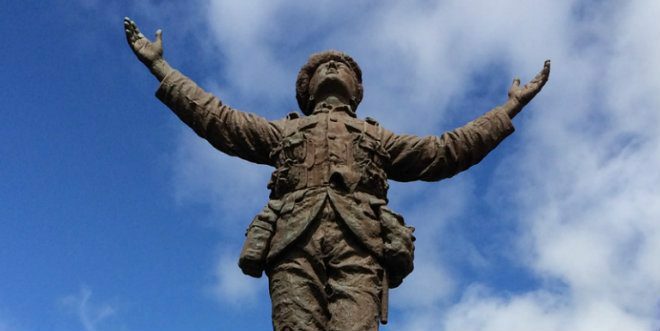 War memorials have been erected across Dumfries and Galloway and annual remembrance services take place where wreaths are laid such as at the evocative Maxwelltown War Memorial shown below. Solway Tours are incredibly proud of the role that Dumfries and Galloway played during the Great War. Many acts of heroism remain unknown due to the horrors of the first industrialised conflict. Each year many local people make a pilgrimage to the Western Front to trace the lives of family members or to commemorate on a much wider scale. As this is the centenary of the conflict at Solway Tours we are keen to continue researching the part that our region had to play in the Great War and we offer guided, personalised tours of the Battlefields of France and Belgium. From leading Battlefields trips for many years we know that anyone who goes on a Battlefields trip goes on an emotional journey. To walk in the footsteps of so many who lost their lives or visit a relatives grave really puts into perspective the great sacrifices that so many made. We truly believe that being guided around the battlefields of Belgium and France gives a greater understanding of the sacrifice made in a way that reading a book can’t. Please contact us at beinspired@solwaytours.co.uk if you are interested in a personalised guided tour of the Battlefields. Mark and Lesley.